Trent Cornelius (Club Director) – A native Angelino, who attended Cleveland High School where he was a standout basketball and volleyball player. Attended the University of Washington on a basketball scholarship (1990-1994) and graduated in 1994 with a degree in political Science. After college, Trent landed a job at Manual Arts where he taught social studies for 12 years. During this tenure he coached basketball and volleyball, winning many league championships and one Invitational Championship in girls’ basketball. His volleyball teams were 5 time league champions and he developed 4 All City Players. In 1999 he founded Starlings Manual Arts which became Starlings South LA. In the spring of 2005 Trent left Starlings South LA and started Starlings City of Los Angeles in the fall of 2006. In June 2010 Trent along with Jeff Nakagawa successfully coached the 18 and under team to 1st place in the gold division at the Starling National Championships and in 2014 won the 14 and under 1st place in the Gold Division. Trent currently is Coordinator of Los Angeles Unified School Districts Athletics program. In his free time enjoys playing sports, traveling, fine dinning, and concerts. Eduardo “Spike” Rauda – A 2 year high school volleyball standout at Manual Arts High School in 2002 and 2003 earning 1st Team All League honors his senior year. Is currently at Foshay Learning Center where he is the head boys and girls volleyball coach. In the 2009-2010 both the boys and girls programs went on to win the CIF LA City Section Small Schools titles. Currently attending Rio Hondo Fire Fighter Academy. Edward loves coaching, working out, sports, movies, cooking, and the beach. Bobby Woodcock – Bobby grew up playing volleyball and basketball in Toledo Ohio. 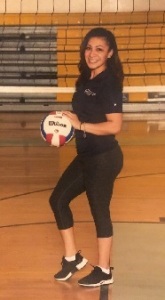 Volleyball soon became her passion which has given her many opportunities to grow within the sport. She started playing club at age 11 and then continued through high school. Unfortunately, an ankle injury that plagued her much of her junior year led her to decide not to pursue a collegiate athletic scholarship. Focused on academics, Bobby attended USC where she discovered club sports and rekindled her love for volleyball. Not only did she play, but she was club president for over 2 years and was instrumental in growing and expanding the success of the club. After graduating with her B.A. in Psychology and two minors in Environmental Studies and Occupational Science, Bobby became very involved in various volleyball leagues throughout LA and Orange County, which included a semester of Beach/Sand Volleyball at Santa Ana College. Bobby most recently joined the staff of Bellflower High School as the Frosh/Soph coach. In fall 2016, she was the JV Coach and Assistant Varsity Coach at San Gabriel Academy, helping the girls win their CIF-SS Division! Bobby played for Starlings Toledo, Ohio in 2008-09 and is excited to be a part of the City of LA coaching staff! Nancy Monge – Nancy is a native to LA. Staying active was a big part of her childhood, always finding new programs to join. Attending Manual Arts High School she was shortly introduced to volleyball her sophomore year. She went on to play 3 years, winning league champions in 2006 with Coach Cornelius. Despite being a late bloomer, she was intrigued by the sport. Joining Starlings 3 years later placing 2nd place Gold division. She is still actively playing when time permits. Giving beach league a try for a year. The 2016 season was her first year with the Starlings family coaching the 12’s team. She is looking forward to growing with this program. Nancy is excited to help build connections between the sport and young athletes. Martin Chiong – Martin started volleyball when he was 14 years old and played competitively all through high school. He attended Santa Monica College and was part of the SMC men’s volleyball team from 2007 -2010 attaining a conference title and standings. After receiving his Associates degree in kinesiology at SMC, Martin enlisted in the U.S. Army and served from 2010 – 2014. After serving, and transitioning out martin decided to continue his studies at CSULA where he is pursuing a degree in Kinesiology in the aspects of rehabilitation. During 2015 He decided to start coaching at Los Angeles Center for Enriched Studies as the JV coach for boys and girls and assistant to the head coach, Jeff Nakagawa from 2015-2018. Sometimes on his free time he would help the SMC men’s volleyball program during their off season and volunteer TA at one of their volleyball classes. This would be his first time coaching in club volleyball and with Starlings COLA, he is looking forward for a fun and enjoyable time with the program.